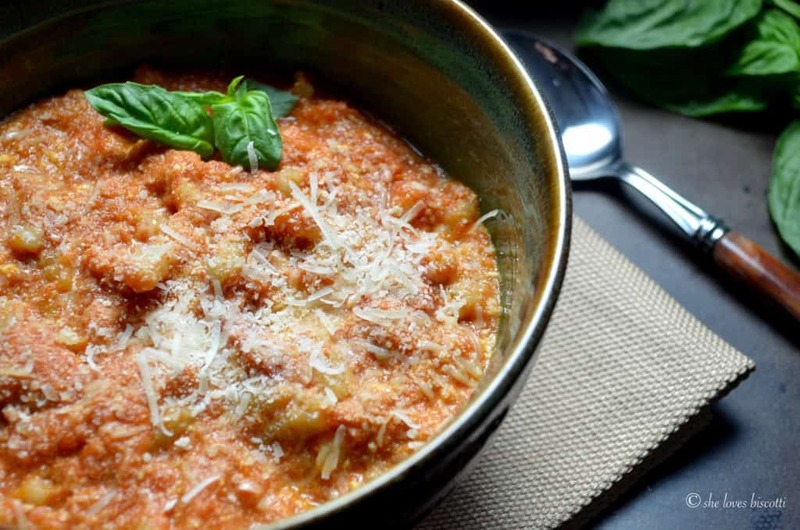 The simple combination of your favourite tomato sauce, ricotta and cavatelli will provide you with a trattoria-style Italian home cooked meal. Come and take a look at how easy it is to make this recipe for Cavatelli with tomato ricotta sauce. 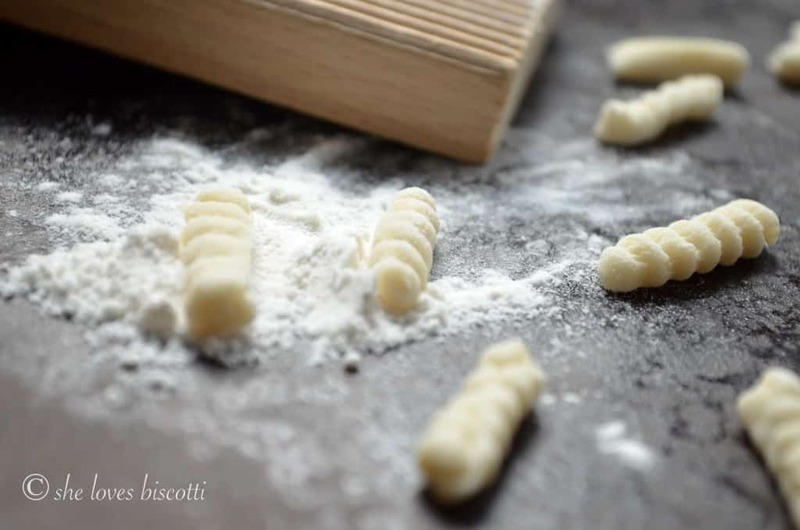 A little over a month ago, I shared my family’s homemade cavatelli pasta dough recipe. (I’ve included a video to show you how easy it is 🙂 ) As in most things Italian, it’s a little time consuming to make, but super simple. I will usually double the recipe so that whenever I need cavatelli, they are waiting for me in the freezer. (If making cavatelli is not your thing, no problem – you can easily use store-bought cavatelli). The pretty shape you see below is obtained by gently pressing the dough into a grooved wooden board. As you can probably guess, this is one of the meals that would frequently find its way to the dinner table as I was growing up. When I think back to my upbringing, I realize that there was a lot of “routine” when it came to meal planning. There was also a lot of simplicity. Pasta dishes were served three times a week: Sunday for lunch, Tuesday and Thursday for supper. Preparation for Sunday lunch was always an elaborate affair, starting at 8 o’clock in the morning with tomato sauce simmering on the stove. I can still remember the wonderful aroma of sauce as I ate my breakfast in the kitchen. This recipe for cavatelli with tomato ricotta sauce is just one of the ways my mom would prepare this pasta. I hope you enjoy this trattoria-style Italian home cooked meal which can be prepared in less than 30 minutes. This simple recipe for cavatelli with tomato ricotta sauce will result in a trattoria-style Italian home cooked meal...comfort food at its' best! Bring a large pot of salted water to boil. (While waiting for the water to boil, you can prepare the sauce). Over medium heat, heat the olive oil in a large saucepan. Sauté the garlic about 3 minutes until fragrant -texture should still be soft-do not allow to brown. Stir in tomato sauce and cook until sauce is thickened (about 7-10 minutes). Add your homemade cavatell to the pot of boiling water. (Cavatelli are done when they rise to the surface). Remove from heat and strain pasta in colander. 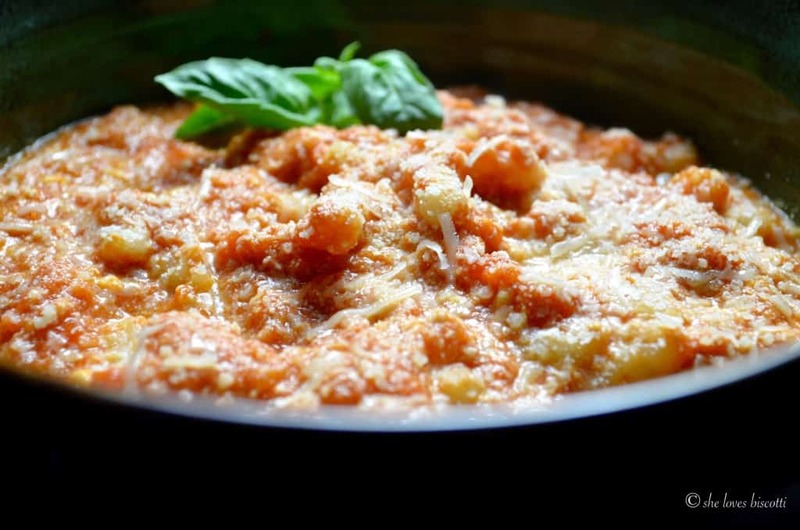 Combine ricotta cheese with tomato sauce. Toss cavatelli with the tomato ricotta sauce. Garnish with basil leaves and romano cheese. 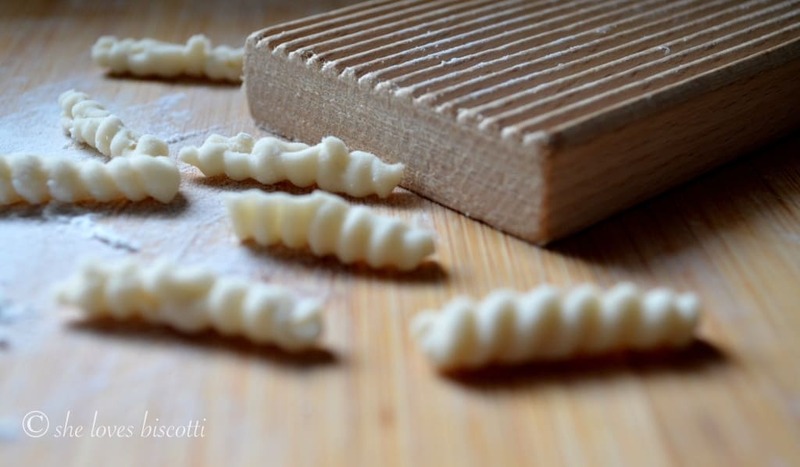 Homemade cavatelli will cook in just 2-3 minutes; frozen cavatelli take about 6-8 minutes. 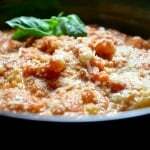 You can adjust the quantity of tomato sauce and ricotta to suit your preference. I can eat cavatelli with just about any sauce. 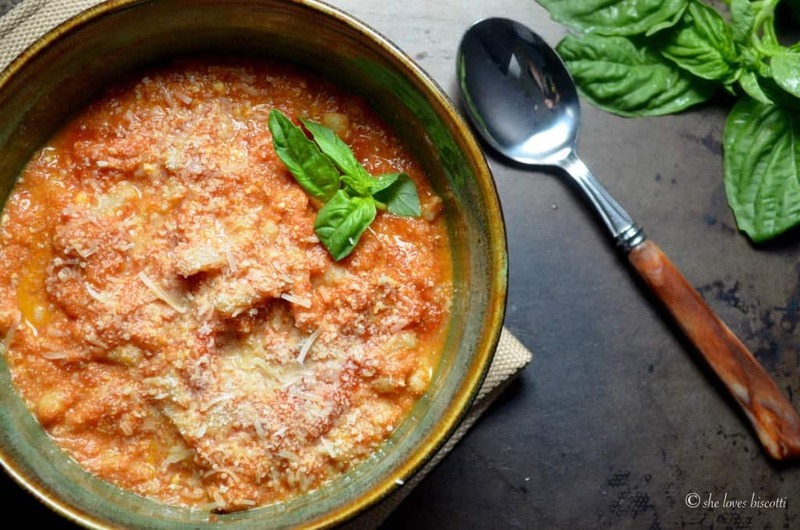 I love the combination of tomato sauce and ricotta. Can’t wait to try this cavatelli recipe. Maria, this looks amazing! 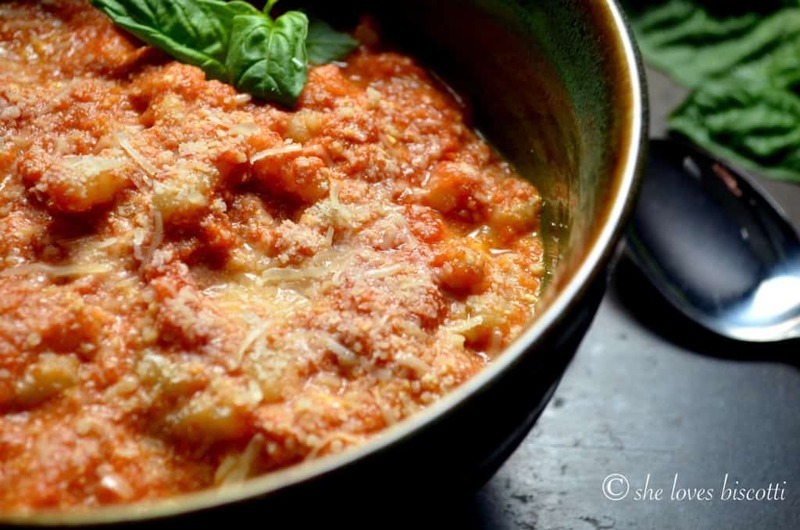 Super cheesy pasta dishes are my favorite, and this one is so easy to make! I think this will be making its way to my dinner table soon! Thank you for the recipe! If you click on the highlighted words “homemade cavatelli pasta dough recipe” it will bring you to the post which has the video on how to make the cavatelli. Great to see it all come together. I love the board. I need to order that. And I am so impressed with the video of how to make cavatelli. Great work! Thanks Deb! Tinkering with video…it was a lot of fun. This is definatley a dish my hubby will love!!! Perfect for traditional sunday lunch!! Will be trying for sure! !